The Up To Mischief Fold Up Bag is a quirky and convenient stocking filler perfect for Spaniel owners and lovers. Measures approximately 42cm x 39cm and comes with a useful pouch for folding the bag up when not in use. 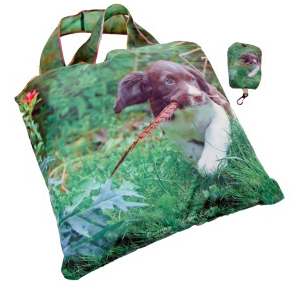 Bag print features an adorable Spaniel puppy with a pheasant feather in its mouth. The pouch is complete with a clasp to attach to a handbag or set of keys, perfect for when out and about on the high street shopping.